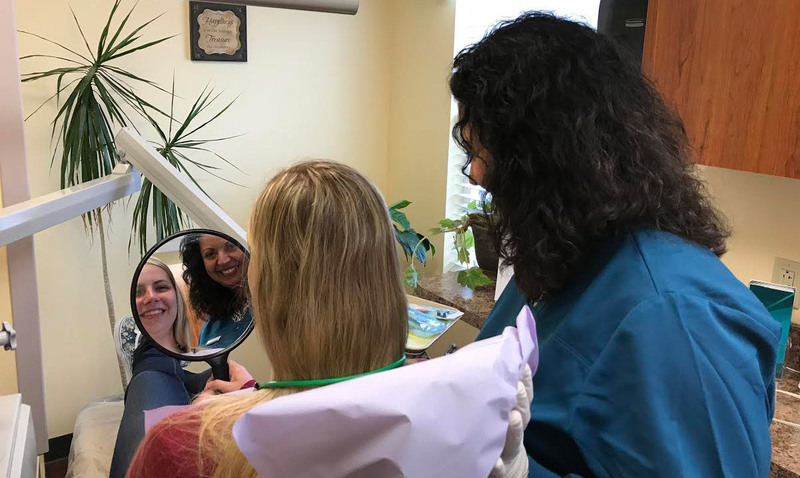 When you visit Alrez Family Dentistry for a “teeth cleaning” appointment you should expect and you will receive way more. During this visit Dr. Alrez or our registered dental hygienist will remove plaque, tartar and stain from your teeth and around your gums. Plaque is a sticky and soft bacteria-infested film and tartar (calculus) is virtually plaque that has become really hard over time. We use hand instruments called scalers and ultrasonic machines that vibrate and spray a cool mist to do a thorough job. Afterwards, we polish and smooth with a rubber rotating cup and certain polishing pastes to create a shiny, smooth surface. We may follow that up with a professional strength fluoride treatment to help strengthen your teeth. Dr. Alrez always review oral home care instructions and demonstrates certain techniques and products based on individual circumstances. Patients visit Alrez Family Dentistry every 3 or 6 months for a cleaning, checkup, and other services. Regular cleanings are very important in preventing tooth decay and gum disease as well as identifying these issues before they become a problem. Regular cleanings often include other services. When our patients have gum disease that involves bone loss around the teeth Dr. Alrez may recommend a “deep cleaning” which basically means there are areas in the mouth where plaque and tarter are below your gums and are causing disease. We use the same instruments we use to do regular teeth cleanings along with numbing solution and laughing gas (if you wish) to make for an uneventful, pleasant experience. Gum disease involves bleeding, swollen, red gums and bone atrophy (“melting”). This in turn leads to bad breath, bad taste in your mouth, sensitivity, root exposure, loose teeth, shifting teeth, and gum recession which also causes your teeth to look too long! The crazy thing is that this disease is commonly painless. The bone loss that occurs in the areas affected will never come back therefore we want to stay on top of gum and periodontal (bone) disease so it does not become too difficult to preserve your remaining bone density and prevent you from loosing teeth. Dr. Alrez does a thorough job when it comes to diagnosing and treating this condition. And knowing that up to 80% of the population unknowingly has some form of gum or jaw bone disease that no cure exists for, Dr. Alrez makes it a point to educate our patients and support them in their quest to keep their teeth for life. When gum disease is not treated it can lead to heart disease and stroke and lead to complications with diabetes and pregnancy. Please come in so we can teach you what you need to know about gum disease.